The long-simmering outrage of Black masses has broken out into a movement against this racist society, particularly its pattern of racist killings by the police. It has not only reverberated internationally, but also made itself felt in the battle of ideas and the sphere of theory.1See “‘We all can’t breathe’: Reflections on Marx’s Humanism and Fanon,” Jan.-Feb. 2015 N&L. Clearly, the subjective transformation has not overthrown the old order. The police have not stopped killing—as seen by the shootings of Antonio Zambrano-Montes in Pasco, Wash; Tony Robinson in Madison, Wisc. ; Aura Rosser in Ann Arbor, Mich.; Yuvette Henderson in Emeryville, Calif.; and Anthony Hill in Chamblee, Ga. There is no confidence that the killers will suddenly start being convicted, even if one or two examples are made—as in the case in North Charleston, S.C., of Walter Scott. His killing in cold blood by white cop Michael Slager—who also placed a taser by his victim’s body to back up his lie that Scott posed a threat—was simply too blatant to ignore, but only because a citizen videotaped the murder. The might of the federal government will not be brought to bear to convict the killers of Michael Brown and Eric Garner, killers set free by local prosecutors manipulating grand juries. Killer cops need fear nothing like the persecution visited on whistleblowers who reveal secrets of corruption, torture, even murder, perpetrated by government agencies like the CIA and NSA. The Justice Department will force the restructuring of one police department in Ferguson, Mo., but leave untouched the bulk of the racist, life-destroying national/state/local criminal injustice system. Every level of that system is racist, from traffic stops, to treatment of young people by cops on the street, to the court system, to prison. Within prison, the system uses brutality to break resistance but also instigates racial divisions, which is why cross-racial organizing, as in the 2011 and 2013 Pelican Bay hunger strikes, is so important—and why the voices of prisoners need to be heard. In News & Letters they are heard in the context of a philosophy of freedom. This is the broadest wave of protests against racist police since the 1992 Los Angeles Rebellion and the revolts it sparked in dozens of communities across the U.S. The rapid nationwide spread of militant protests took established leaders by surprise. They were started and dominated by youth of color, and attracted a significant minority of whites, as well as Black, Latina/o, Asian, and Native American. Today, women are, at least in some places, acknowledged leaders in the Black Lives Matter movement. In Ferguson Johnetta Elzie, 25, who lived near where Michael Brown was shot, decided to look into it herself when she heard about it on Twitter at the time Brown’s body was still lying in the street. She helped organize demonstrations and, with DeRay Mckesson, began to produce an email newsletter (thisisthemovement.org) to tell the story of what was really happening in Ferguson. The newsletter now has over 14,000 subscribers. She makes the point of how inclusive Ferguson has been because, she says, “Blackness is all-inclusive….There are Gay and Lesbian folks, bisexual, there are religious Black people, there are atheist Black people.” This recognition, too, is new. As in movements from Hong Kong’s Umbrella Revolution to anti-austerity direct actions in Greece, youth are in the forefront, challenging not only the government but established groups and their approaches. At a national march on Washington last December that was called by Al Sharpton’s National Action Network, some youth demanded the microphone. Before the mike was cut off, Elzie declared, “This movement was started by the young people. We started this. It should be young people all over this stage.”2Gene Demby, “Protesters Of Police Violence Divided By Generation,” Dec. 14, 2014, NPR Weekend Edition. In New York, two young women were mostly responsible for organizing the massive 60,000 strong Millions March. Both are artists, Synead Nichols, 23, and Umaara Elliot, 19. 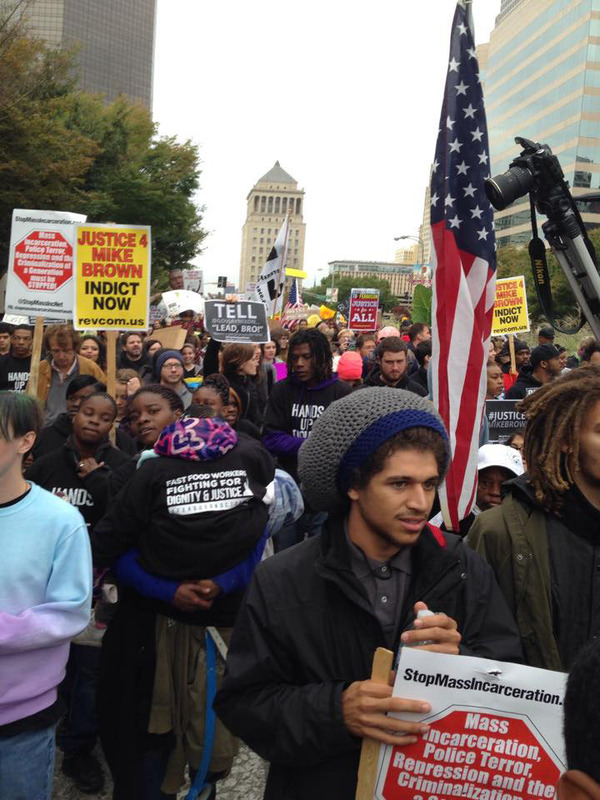 It is no accident that Black Lives Matter events keep crisscrossing with strikes and protests for a $15 minimum wage. In these movements it is widely understood that we are up against an establishment, even a social system. The same forces cheering on cops who kill Blacks also support busting unions, throwing people off food stamps, shutting down abortion clinics, and legalizing discrimination against LGBTQ people. This philosophical foundation becomes even more urgent today, when the election of a Black president cannot hide the resurgence of virulent racism, from the police killings of young people to the code words of national politics, from resegregated schools to racially slanted budget cuts in government jobs, unemployment benefits and Medicaid. 1. ↑ See “‘We all can’t breathe’: Reflections on Marx’s Humanism and Fanon,” Jan.-Feb. 2015 N&L. 2. ↑ Gene Demby, “Protesters Of Police Violence Divided By Generation,” Dec. 14, 2014, NPR Weekend Edition. This entry was posted in Articles and tagged $15 an hour, abortion clinics, African American, Al Sharpton, American Civilization on Trial: Black Masses as Vanguard, Andrea Ritchie, Anthony Hill, anti-abortion, anti-austerity, anti-Gay, Antonio Zambrano-Montes, Arab spring, atheist, Aura Rosser, Bisexual, Black Lives Matter, Black women, Brandi Grayson, capitalism, CIA, criminal injustice system, cross-racial organizing, DeRay McKesson, dialectic, Eric Garner, fascism, Ferguson Missouri, food stamps, Greece, Greek masses, Johnetta Elzie, killer cops, lesbian, lgbtq, Living wage, Los Angeles Rebellion, marriage equality, Marxist-Humanism, Marxist-Humanist Perspectives, McDonald's, Michael Brown, Michael Slager, movement from practice that is itself a form of theory, National Action Network, new society, New York City, News & Letters, News and Letters Committees, NSA, Occupy Wall Street, Pelican Bay hunger strike, philosophy of revolution, Prison, prison strikes, Queer youth of color, racist, Republic Windows and Doors, state violence, Streetwise and Safe, structural economic crisis of capitalism, students, Synead Nichols, thisisthemovement.org, Tony Robinson, Umaara Elliot, Umbrella Revolution, union, University of Wisconsin, voices from below, Walmart, Walter Scott, Wisconsin, women of color, Young Gifted and Black Coalition, youth, Yuvett Henderson. Bookmark the permalink.